Been a while since I’ve been here. The good news is that I’ve been busy doing cool stuff! So I’ll try to give you the readers digest version here, and then longer later. So I’m happy to announce that Wizard World Conventions have added me to five—yes, that right, FIVE of their upcoming shows. They are: Nashville on September 25-27, Ft. Lauderdale on Oct 2-4, Greenville on July 15-17 2016, Raleigh NC TBD 2016, and Orlando Aug 5-7 2016. Yes, I’m very excited about these shows. I’ve never done a comic show in any of those cities except Orlando. Others shows I’ll be at: Mt. Dora on Sept 19, Daytona Beach ComicCon on Dec 6, and of course, I’ll be presenting at the Florida Writers Conference on Oct 15-18. SO, mark those dates on your calendar and come see me. AND, depending on how quickly we can get them done, hopefully there will be some new projects to show you. 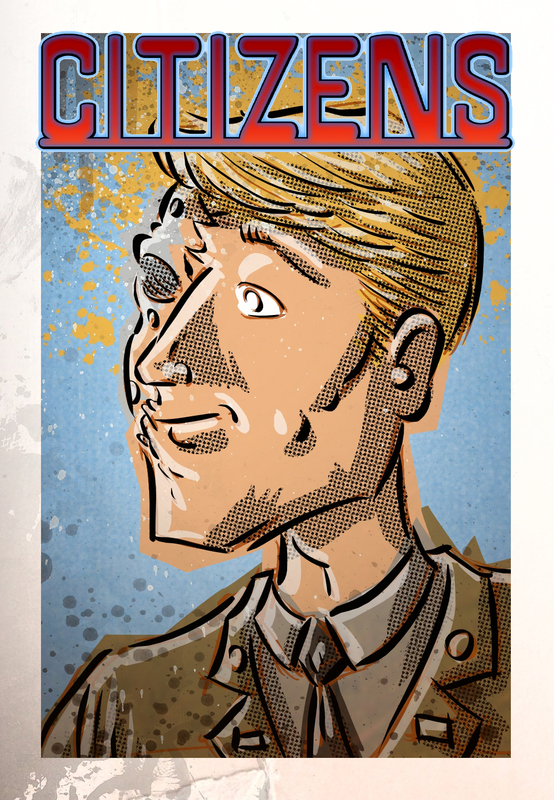 First and foremost, I’m … just … moments … away … from launching a kickstarter campaign for the CITIZENS graphic novel I’m working on with super talented artist Joe Badon. Oh, trust me, you’ll hear about it here when it happens. I’m told I have to “media blitz” when it’s happening…so, don’t hate me when it happens. Heck, I’m going to depend on YOU to help me. Panel from an upcoming graphic novel with artist Deonna Herrold. In a really wild story of how they met, I started working with up and coming artist Deonna Herrold on a graphic novel. 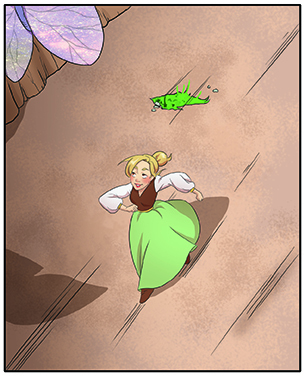 I’ll tell you that story later, but here’s a peek at one panel from a page she’s done. She’s all high-tech on the computer, but it’s been very cool to watch her process. I’m also excited to tell you that I have two new graphic novels now available in either print OR digital. Demon’s Tails collects the four issue mini-series published by Adventure. So what are you waiting on? Click the links and go buy a copy! I’m also working with a couple of other artists that I don’t want to mention yet for fear of jinxing the projects…it’s way early anyway, but I’m still pretty excited about the prospects! Oh…and I joined a writers group again. First time in a long time, but I’m pretty stoked about it. Okay, there’s the update. Until next time! 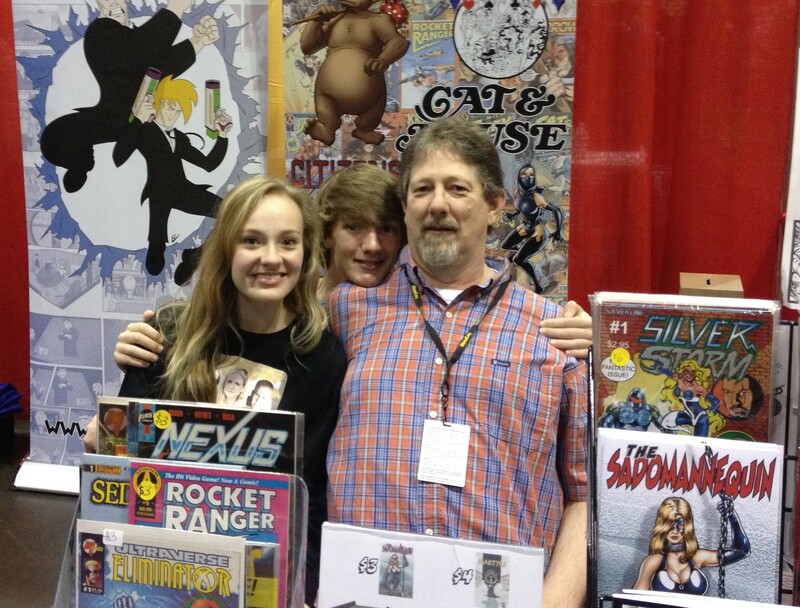 Me, Brittany and Brett (attempting–but failing to hide behind us) at the booth! 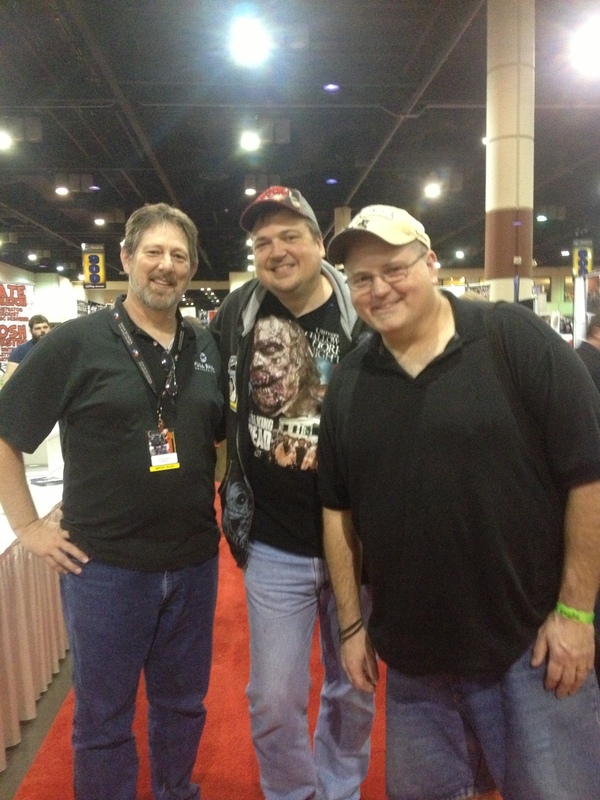 As has been my habit the last few years, today’s entry will be a report on MegaCon 2015, which was held last week (Friday, Saturday and Sunday, April 10-12). This was the third year sequentially for me to be at MegaCon since moving to Florida, and my fourth MegaCon overall (the first time I went to MegaCon was in the late 90s—I wasn’t blogging then). Some of you recall my post from last year when I talked about the clogged aisles. It seems all that was resolved this year with the move back to the west arena. While there were still massive crowds (I never saw a final count), the aisles had been expanded allowing for greater foot traffic and stopping for cosplayers. It was still crowded, but with lots of elbow room. 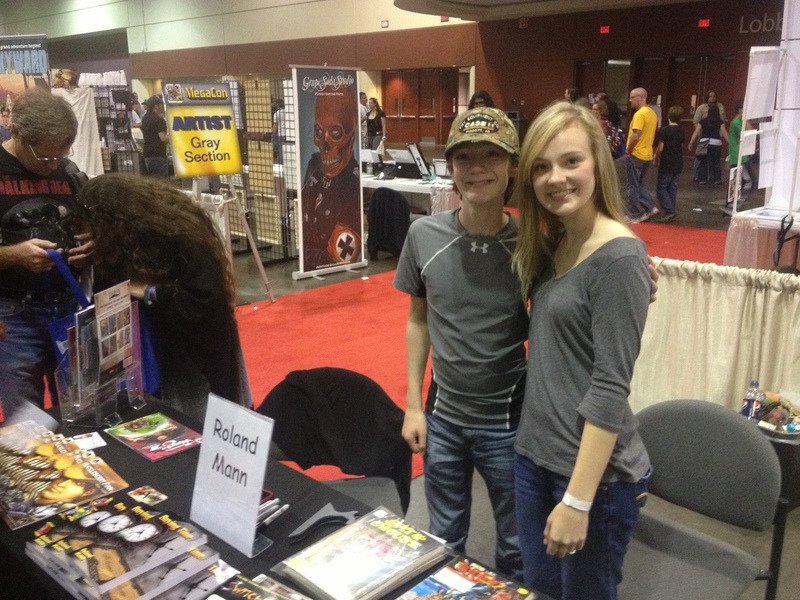 I’m making the face because the young fan (to the right) said I didn’t look like my caricature. After I smiled, she agreed I was indeed Roland Mann. I shared the booth space with writer Wes Locher (who is also a former student of mine) because the price tag was higher than I really thought I could make. That was a good decision because a)I got to spend time in the booth talking with him when there were occasional lulls (and they were occasional); b)it cut the cost in half…which ultimately meant I covered my portion of the table—which is always nice. We did a give-away together and gave away $50 worth of books to Matt de Simone and Lucas Loman. I got to take the annual photo with Robert McGinty…but I can’t seem to locate it. Had great dinners both nights; Friday night with the aqua-talented Paul Pelletier and Saturday night with Barry Gregory (and son!). Missed this year was old pal Bill Sawyer. I didn’t do a panel this year. There seemed to be confusion about the Mega-folks the last part of the year—at least in their communication with me. They announced they’d sold the show a few days before the start, so I’m guessing that’s where all the confusion came from. The previous two years were smooth sailing. As with good shows, I’m already anticipating next years. It’ll be moved to May (Memorial Day) next year…which I’m skeptical of (but note that I already said I was anticipating next year!) only because there are so many other shows in the summer, I’d rather see them move it the other way on the calendar. Part of the reason I think the April show worked is this is Florida. It’s not cold in the winter, regardless of what the locals say! And for you Orlando-local people, don’t forget to mark May 2 on your calendars. It’s FREE COMIC BOOK DAY and I’ll be signing books at the COLISEUM OF COMICS in the Fashion Square Mall—all day long! Come see me! 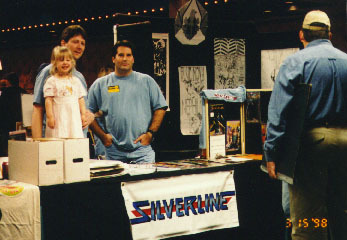 Me, Brittany, and Tony Fortenberry at MegaCon in 1998. 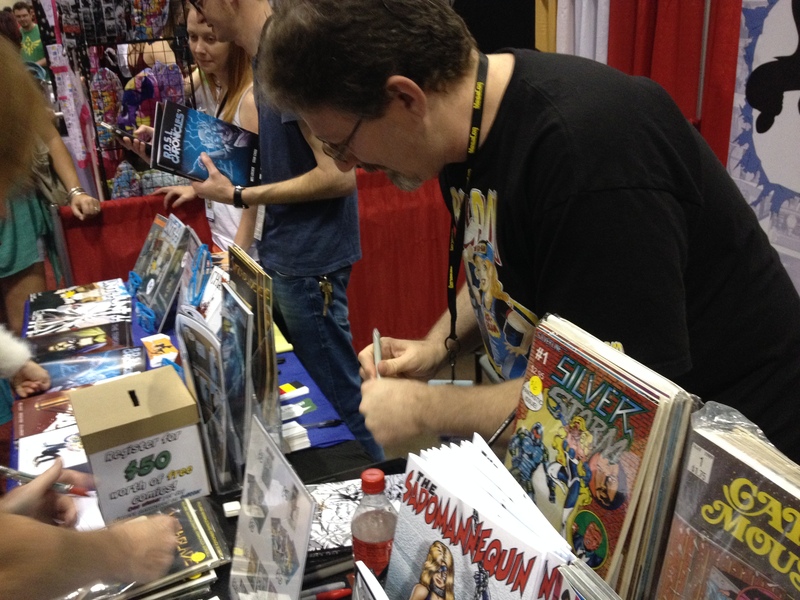 I feel a bit guilty that I’ve talked about or mentioned Megacon in my last three blogs…but doggone it, I’ve been pretty excited about it—and with good reason. So, this is my report on it! Brett and Brittany doing table duty at the show. I didn’t realize they color-coordinated until looking at the picture. I’ve only attended Megacon once before, and that was in 1998. I don’t remember the drive at all, but do remember staying with good pal Tony Fortenberry and his wife Claire. I also remember having a great time…and yes, we went to Disney after! So, 15 years later, I’m anticipating great things and I wasn’t disappointed. Friday the kids and I set up shop around noon. Unfortunately, Brittany wasn’t feeling well and the first hour or so was occupied with find medicine for her—there’s a story all in itself! 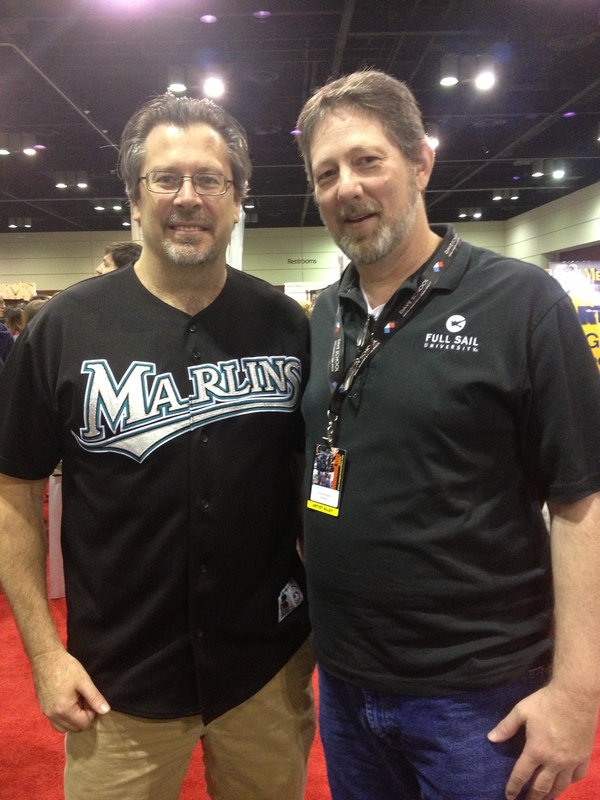 Robert is an Ultraverse fan who stopped by to chat…and I discovered he was a kicker for the Florida Gators…several years back! How cool is that? Tired and anticipating a big Saturday, the kids and I headed back to the apartment. Me with Thomas Florimonte and Barry Gregory. I’ve known Barry since the 6th grade. We were creating comics together by the 7th. Yes, they were on notebook paper, but still! Saturday was indeed a big day. I haven’t seen such long lines since the last time I went to San Diego Comic Con. 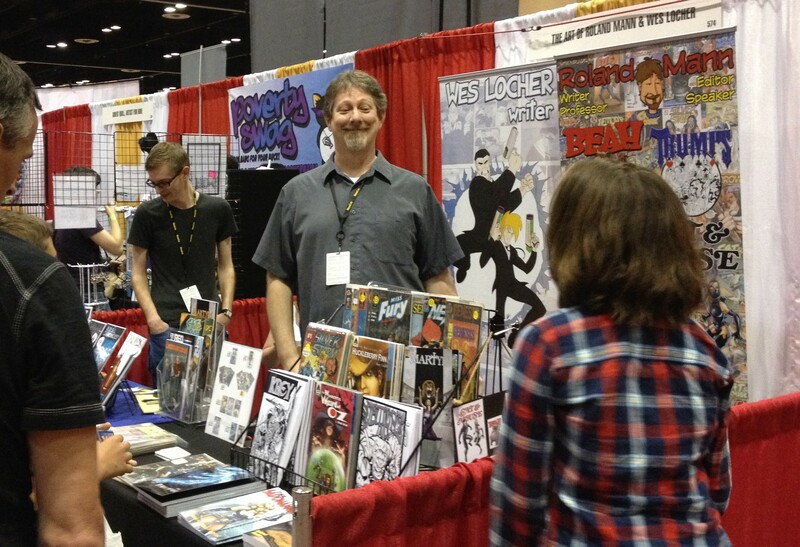 In fact, Megacon 2013 reminded me a LOT of SDCC when I last went. The parking lot was packed and we had to park in the back, back 40! When the doors opened, the crowds streamed in. The aisles were jammed packed with congoers, all of whom had great attitudes about the entire thing. Lots of folks stopped to get books and signatures. The Wizard of Oz graphic novel proved to be the most popular title on my table for the weekend. One nice fan brought me some comics to sign and I told her that I didn’t write them. She insisted (nicely) that I did and when I opened the cover to check out the credits, Brett immediately pointed to my name indicating me as the writer. 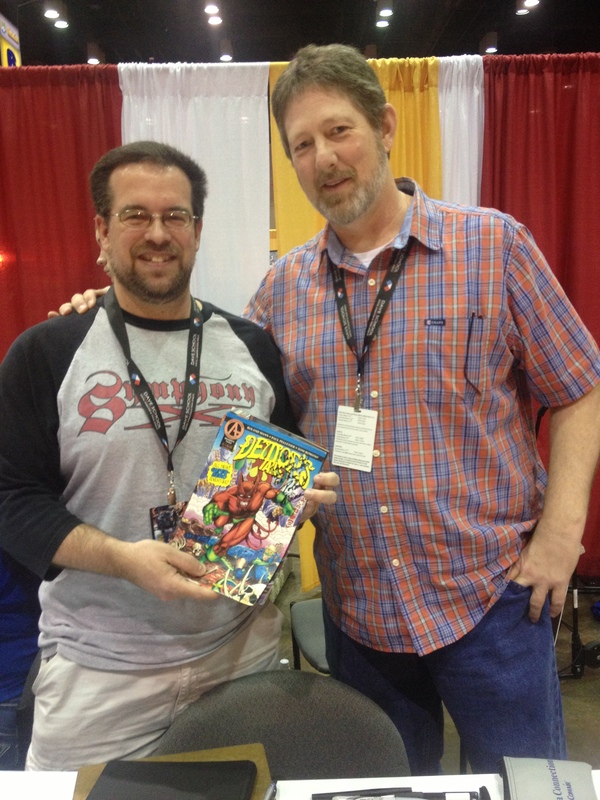 Me with Paul Pelletier holding a copy of DEMON’S TAILS, a mini-series that I wrote and he drew…oh so long ago. It was a short lead-up story to the Eliminator mini-series that I co-wrote with Hank Kanalz. I had just flat forgot all about it. I gladly signed her copies—but now I’ve got to go hunt those things down for me! I also got to meet Robert McGinty, a guy who I’ve only ever chatted with on Facebook’s Ultraverse page. I learned he was a kicker in the SEC! 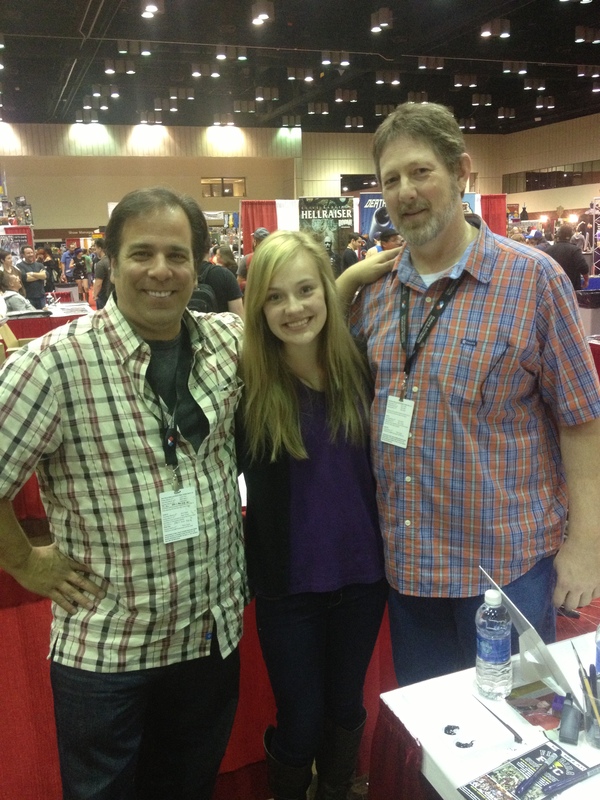 Me and Brittany with supercool comic rockstar Jimmy Palmiotti. He took time to offer some good advice to Brittany in regards to getting “into” the acting business. 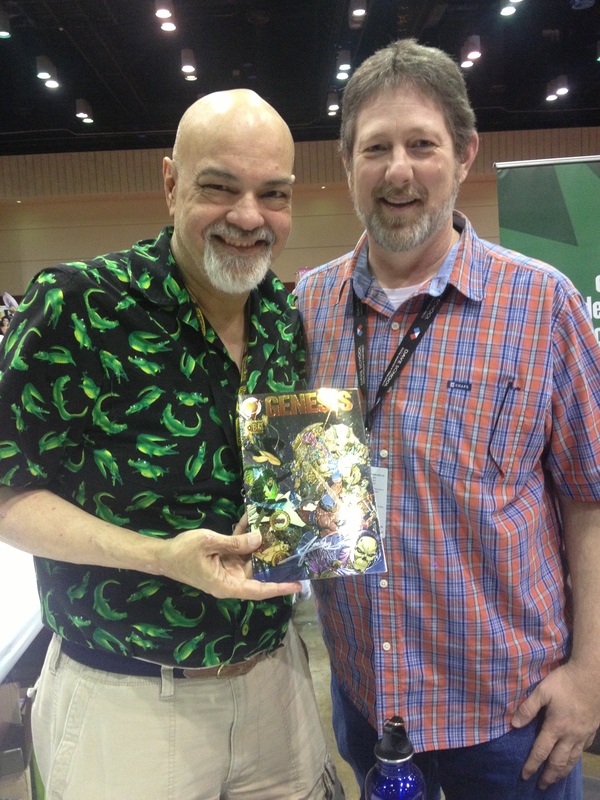 Me with George Perez. He’s holding a copy of Genesis #0 for which he did the cover. An anthology, I wrote one story (drawn by Jimmy Palmiotti) and edited the others. Sunday was quite a bit slower and all the artists around me were dragging a bit. I got to see and visit with friends George Perez, Jimmy Palmiotti (who was kind enough to take a few minutes to offer Brittany some suggestions for getting into the acting industry), Billy Tucci, Chuck Dixon, as well as make new friends of Brian Demeter and Michael Bramson. Both were incredibly cool guys as well as talented artists. And yes, once Megacon was over, we made the 12 hour drive back to Mississippi. And yes, we were dog-tired (and Brittany caught some kind of bug while there). All in all though, we’re all looking forward to going to Megacon again next year!